Our value is our ability to relate to you, discern your information needs, sort through and discard vast amounts of inadequate or incorrect information, and then dig deep into valid resources that either requires special access or cannot be found through simple Web searches. In the end, with our research, we identify the truths you need to make the most informed business decisions possible. Our forensic research process involves gathering the intelligence you need to make decisions on anything from potential new markets to competition, technology trends, R&D efforts and more. Relevant business research helps you make better strategic decisions. We specialize in providing legal research for trial consultants and litigation professionals, supporting the juror selection process with social media and public records research. We also provide litigation support for intellectual property law firms providing declarations of public availability. We connect the dots by locating small details that contribute to the big picture. We search databases to locate and interview the right people who can share details about your prospects. Our international network of expert researchers, private investigators, attorneys, translators, and other professionals help us verify degrees, search local public records, and direct us to additional local resources. We provide you with a customized report which includes key findings on past business dealings, legal and regulatory issues, personal details and more. We alert you to inconsistencies or the absence of significant findings which would be a warning sign for potential fraud. Our team includes a licensed fraud examiner. 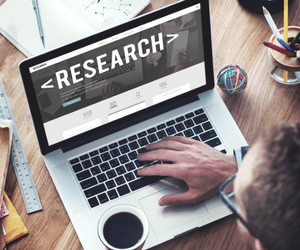 Anyone can say they can conduct research; however, our being immersed in information on a daily basis enables us to be ideal partners to assist you with content creation. In our everyday research, we see many different potential leads for content, which is both authoritative and reliable, which you can use for your social media posts. If you use content discovery tools, we provide you with enough information to complete the ideas. To learn more about our social media content support, read this.